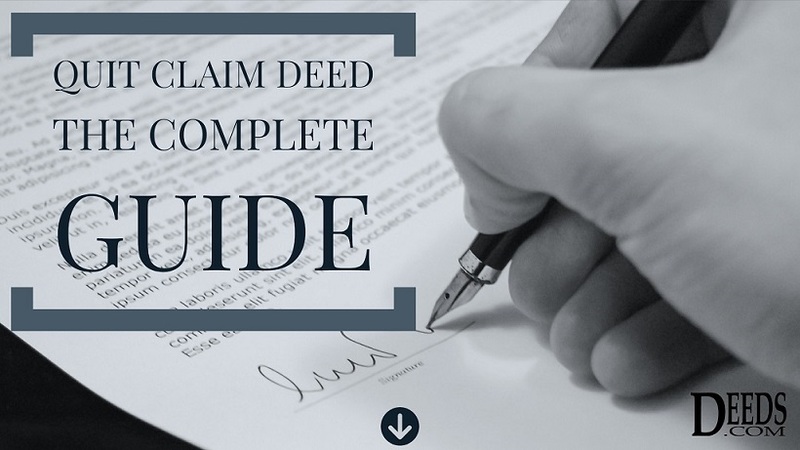 The quitclaim deed is a legal document (deed) used to transfer interest in real estate from one person or entity (grantor) to another (grantee). Unlike other legal conveyance deeds, the quitclaim conveys only the interest the grantor has at the time of the deed's execution and does not guarantee that the grantor actually (legally) owns the property. Without warranties, it offers the grantee little or no legal recourse against the seller if a problem with the title arises in the future. This lack of protection makes a quitclaim unsuitable when purchasing real property from an unknown party in a traditional sale. It is, however, a useful instrument when conveying property from one family member or spouse to another, and it is commonly used in divorce proceedings or for estate planning purposes. Title companies may require a person to execute a quitclaim document in order to clear up what they consider to be a cloud on the title prior to issuing title insurance. Similarly, prior to funding a loan, lenders may ask someone who is not going to be on a loan, such as a spouse, to complete and record a deed quitclaiming their interest. Quitclaims are often used to transfer property to and from family members. Transfers between parents and children, between siblings, and between other closely related family members are easily done with this type of deed. Adding Or Removing A Spouse From Title. Whether resulting from a divorce or a marriage, a property owner can use a quitclaim to add a spouse to or remove a spouse from the title of the property. It is possible for an owner's name to change during the course of ownership. This is true for a natural person or any other entity that can legally own real property. While it is not required to change the information listed on title when an owner's name changes, it is a good idea to do so. 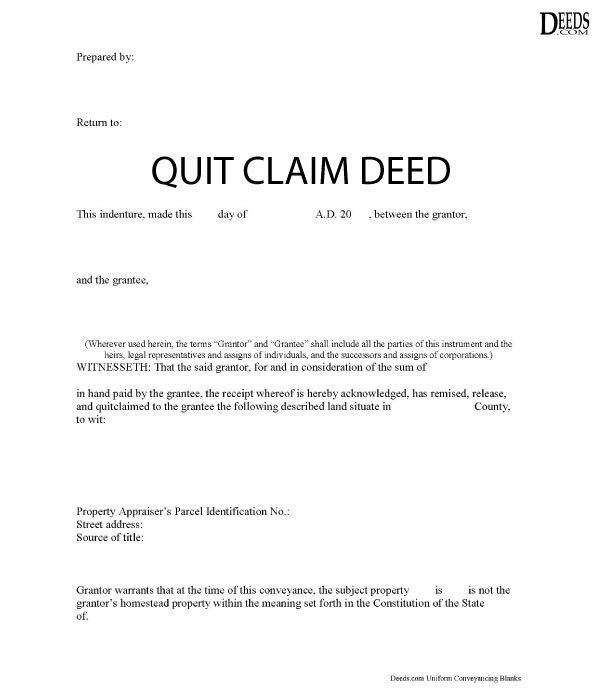 It is common to use a quitclaim deed to reflect name changes on title. There are many reasons for a name to change, marital status is the most common. Transferring Legal Ownership To An LLC Or Corporation. With holding of real property in the protection of LLC's and Corporations becoming more common, quitclaims are generally used to transfer ownership to those entities. Corporate transfers are usually done with this type of deed as it is a transfer between closely related entities. Transferring Ownership To A Trust. As with corporate transfers of ownership, transfers to a Trust are equally common. Family planning that deals with property meant to carry on through generations often involves an initial transfer from a family member into a trust. Removing A Cloud On Title For Title Insurance. In the process of insuring title, title companies may find a "cloud" in the title. Generally this means that there appears to be someone may or may not have an interest in a property that has not been accounted for and it is causing a break in the chain of title. It is common for the company insuring the title to require the person in question to quitclaim their interest in the property prior to issuing the title insurance. In order for the quitclaim to be valid it will need to be delivered to AND accepted by the grantee. There is very little in the way of guidelines as to what constitutes delivery and acceptance. It is a good idea for the grantor to get something in writing from the grantee stating that they have received and accepted the quitclaim document. Once the completed document has been signed by all required signers, delivered to and accepted by the grantee, it is considered legally executed. The final step in the quitclaiming process is generally the recording of the executed document by the grantee. It is not always required for the document to be recorded in order to be valid however it is almost always required in order for the document to be binding on third parties. The recording of the document is done at the recorder's office where the property is located. The title of a legal document tells the world what type of document it is. In this case the title is "Quitclaim Deed"
This is the date that the legal document was completed, signed, and executed. This is the person or persons that is transferring their rights to the real estate to someone else. or any other entity that can legally own real estate. This is the person that is receiving the ownership rights that are being transferred. Again here, the term "person" refers to any entity that can legally own real estate. This is the meat of the deed, the legal speak which actually transfers the rights to the property. Generally it is a phrase similar to: "...does hereby remise, release and quitclaim unto the said Grantee forever, all the right, title, interest and claim which the said Grantor has in and to the following described parcel of land, and improvements and appurtenances thereto..."
This is what the Grantee gives to the Grantor in return for the rights to the property. While in some cases a deed may be enforceable without consideration it certainly muddies the water. It's a good idea to check with a tax accountant before transferring real estate with a "no consideration" or "gift" deed as there may be tax issues. Here is where the description of the property being transferred is listed. The format of the legal description varies from state to state. The "lot and block" legal description is the most common however it depends on your state. A typical lot and block description looks like: "QCD SUBDIVISION, 2ND AMD, LOT 112 BLOCK 3". Most states require only the Grantor to sign the deed and for it to be delivered to the Grantee for it to be valid. Grantor's signatures usually must be notarized and in some rare cases separate witnesses must also witness the Grantor signing. This section lets the world know who prepared the deed. Generally this is the Grantor or an attorney. 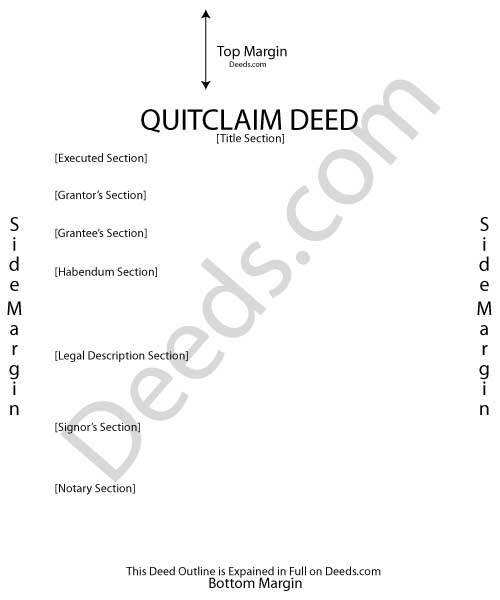 Quitclaim deeds can have an impact on the continuance of title insurance. Executing a deed can also create issues with your mortgage such as triggering a due on sale clause. Check with your title insurance provider or lender prior to executing a deed to see if there will be any affect on your policy coverage or mortgage. It is common during a divorce for one spouse to quitclaim their interest in a property to the other spouse. If there is a mortgage on the property it is important that you understand this does not remove your obligation to the mortgage. it is not advisable to execute a quitclaim until addressing the mortgage obligation. You could end up responsible for the debt with no say as to what happens to the property. Unfortunately, there has been an increase in real estate fraud in recent years and many cases involve a quitclaim. Theft by forgery is the most common fraud committed. If you are purchasing real estate, especially from someone you do not know, and they offer to transfer the property to you using a quitclaim deed you should seek the advice of a legal professional or at the very least consult someone at a title company. If you own real estate and are asked to sign a quitclaim deed, know that you are giving your real estate to someone else and you will not likely be able to get it back. This is common in a "save your home" type of scheme. Fraud is not a new issue, in 1880 a Michigan court (Peters v Cartiera) said this of quitclaim deeds: Under the cloak of quitclaim deeds schemers and speculators close their eyes to honest and reasonable inquiries and traffic in apparent imperfections in titles. Each state has its own statutory requirements for quitclaim deed forms. These requirements determine the content or text that is in the deed. Quitclaim forms must meet statutory conditions for content and format. In addition, many local recording authorities add requirements for margins, paper size, property identification, and many other details. If a deed form is not in accordance with both the local and state standards, there may be additional fees charged for recording or the form may be rejected altogether. Quitclaim deeds were not common in the United States until the mid-1800s when property ownership started to mature after the revolutionary war. (Fig2.) Prior to that, real property was transferred primarily via a process that involved warrants, surveys, and land patents. The quitclaim gained popularity because of the inefficiency of the early land record systems. If there were discrepancies in the chain of title because of lost, stolen, or inaccurate records they could be cleared up by requesting a potential interest holder "quit" their claim to the land. Fig2. 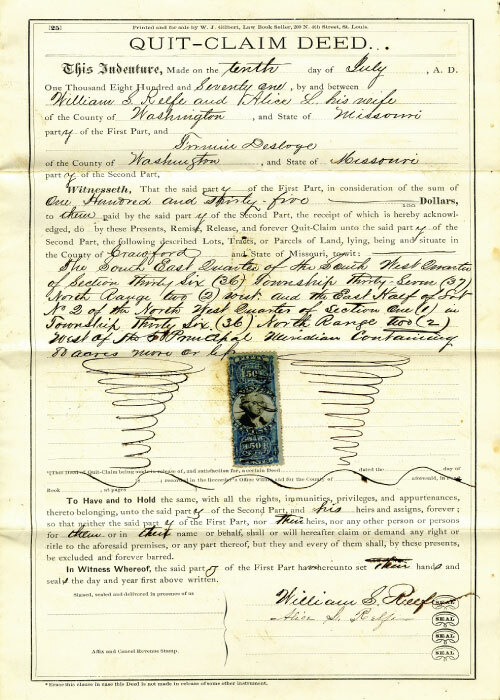 - Quitclaim Deed from 1871, the more things change the more they stay the same.